COLORADO SPRINGS, Colo. — The USA Triathlon Board of Directors has approved an increase in funding for USA Triathlon, in partnership with the USA Triathlon Foundation, to support collegiate triathlon programs at the club and varsity levels. Additional resources will support new and existing collegiate programs, as well as fund a special grant for Historically Black Colleges and Universities (HBCUs). All grants will be distributed by the USA Triathlon Foundation, a 501(c)(3) non-profit organization that serves as the charitable arm of USA Triathlon. Deemed an NCAA Emerging Sport for Women in 2014, triathlon has a 10-year window to demonstrate sustainability as an NCAA sport option. 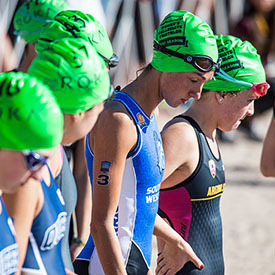 USA Triathlon is more than halfway to its goal of recruiting 40 schools by 2024 to earn full-fledged Championship sport status, as 25 schools currently offer the sport at the varsity level for women. The USA Triathlon Foundation Women’s Emerging Sport Grant, which is distributed to select NCAA membership institutions to develop, implement, grow and sustain women’s triathlon programs at the NCAA varsity level, will be supplemented with an additional $670,000. Grants will be prioritized for schools who commit to sponsoring varsity women’s triathlon programs by 2021. Funding is typically distributed over three years, and the total amount varies for NCAA Division I, II and III programs. For current varsity women’s triathlon programs, $25,000 in grant funding is now available to offset travel costs to Women’s Collegiate Triathlon Regional Qualifiers and the Women’s Collegiate Triathlon National Championships. In addition, USA Triathlon is offering a $225,000 grant for the first HBCU that adds women’s triathlon as a varsity sport. The funding is earmarked specifically for an HBCU in a proactive effort to increase diversity in collegiate triathlon. The grant will be distributed over a five-year period and may support travel, equipment, coaching, scholarships and other expenses related to building a sustainable varsity program. At the collegiate club level, USA Triathlon will dedicate $50,000 in grant funding over two years to club programs as part of an ongoing recruitment and retention strategy. Eligible clubs may be new, restarting or existing, and may include men’s clubs formed alongside varsity-level women’s programs. Approximately 140 colleges and universities in the U.S. offer triathlon as a club sport, and 120 participated in the 2018 USA Triathlon Collegiate Club National Championships in Tuscaloosa, Alabama. For more information about grant opportunities at the varsity and collegiate club levels, contact Jessica Welk at Jessica.welk@usatriathlon.org or 719-955-2824.